Bunny Crayon Holder, In The Hoop - 2 Sizes! 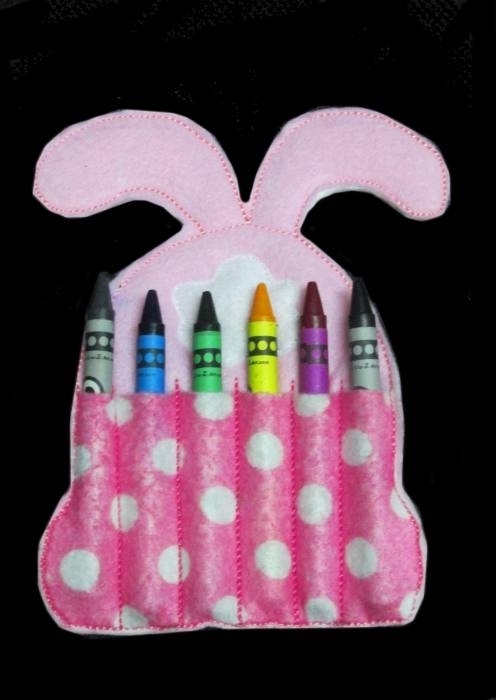 This is an adorable In hoop Bunny Crayon Holder. The 5x7 holds 6 crayons and the the 4x4 holds 4 crayons. This is an adorable In hoop Bunny Crayon Holder. The 5x7 holds 6 crayons and the the 4x4 holds 4 crayons. Easter Bunny Nose In Air Applique - 3 Sizes! Easter Bunny Mommy - 3 Sizes! Finish Size 3 (3/16)" x 3 (3/4)"
Finish Size 4 (15/16)" x 5 (15/16)"
All Nobbie Neez Kids/Band To Bow Artwork is Copyrighted and Trademarked and is protected in the United States against people who try to resell the designs. You may never copy, trade, sell, transmit, share, give away, or include any design from Band To Bow & Nobbie Neez Kids.